Need help with your Maytag washer? 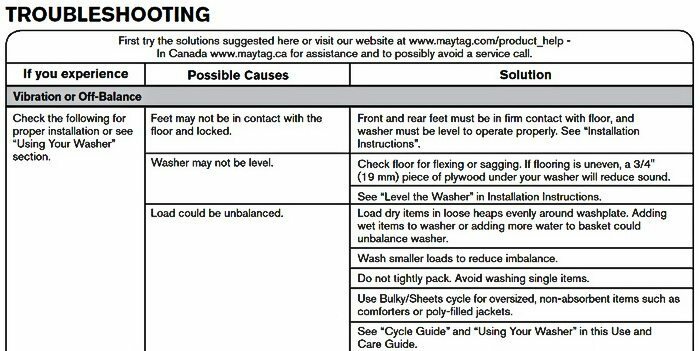 MAYTAG TOP-LOADING WASHER TROUBLESHOOTING AND CARE GUIDE. 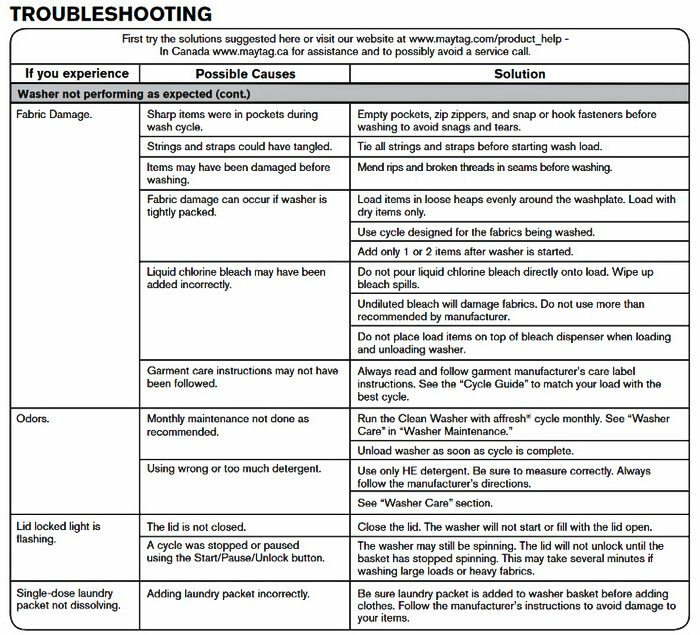 This guide will help you with troubleshooting your Maytag Washer. 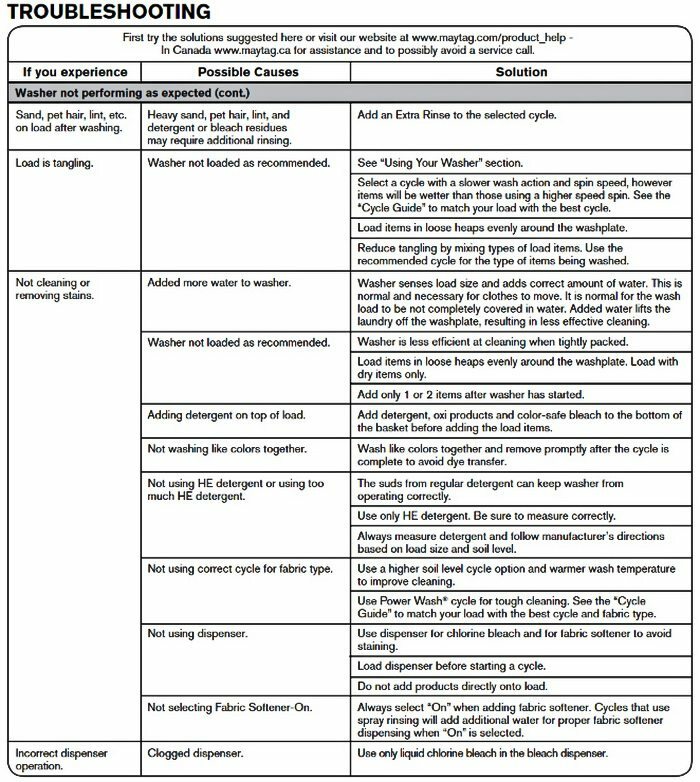 Below is a Use and Care Guide, Troubleshooting information and helpful repair tips. 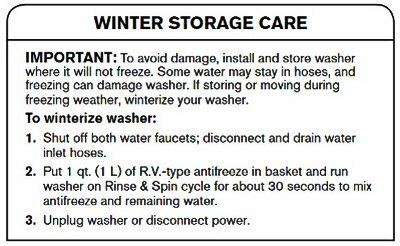 See below for all the info you need to use, care, and fix your Maytag Washer. 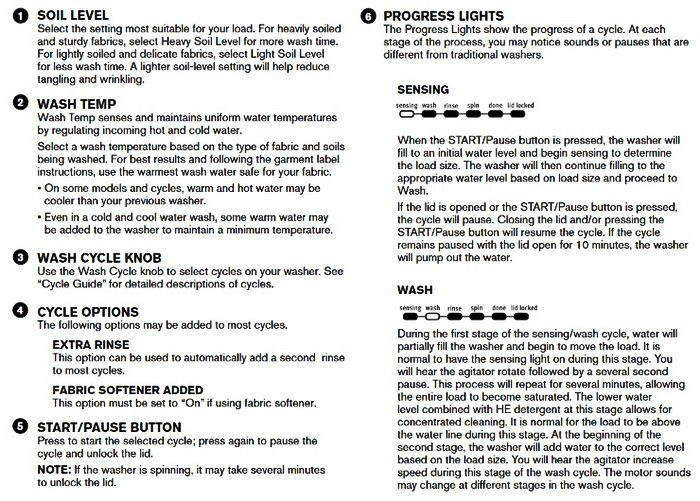 If needed here is a QUICK START GUIDE to begin using your new Maytag Washer. 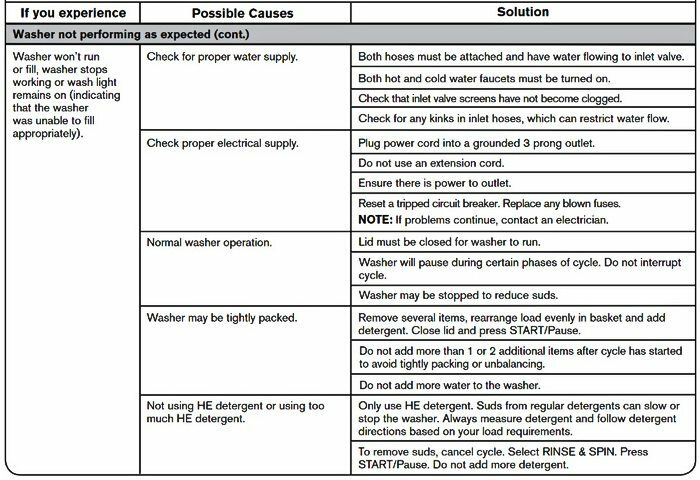 Read these instructions completely before beginning the routine cleaning processes recommended below. This washer maintenance procedure should be performed, at a minimum, once per month or every 30 wash cycles, whichever occurs sooner, to control the rate at which soils and detergent may otherwise accumulate in your washer. This washer has a special cycle that uses higher water volumes in combination with affresh Washer Cleaner or liquid chlorine bleach to clean the inside of the washer. a. Open the washer lid and remove any clothing or items. b. Place an affresh Washer Cleaner tablet in the bottom of the washer basket. 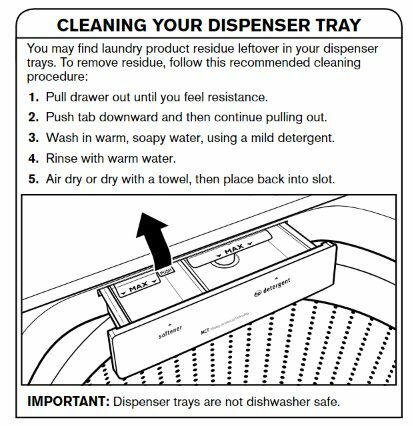 c. Do not place an affresh Washer Cleaner tablet in the detergent dispenser. d. Do not add any detergent or other chemical to the washer when following this procedure. e. Close the washer lid. f. Select the Clean Washer cycle. g. Press the START/Pause button to begin the cycle. NOTE: For best results, do not interrupt cycle. If cycle must be interrupted, press Power/Cancel. (For models with no Power/Cancel button, press and hold START/Pause for three seconds). 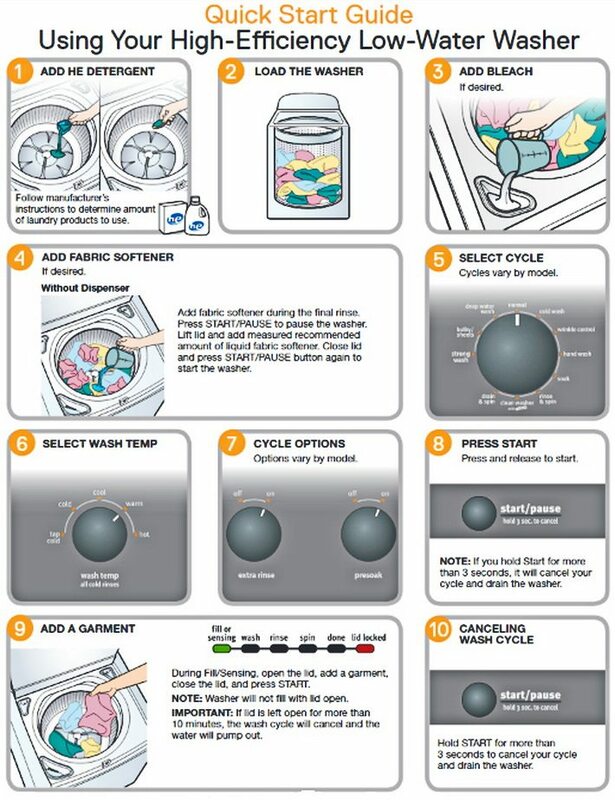 After the Clean Washer cycle has stopped, run a Rinse & Spin cycle to rinse cleaner from washer. -Feet may not be in contact with the floor and locked. -Front and rear feet must be in firm contact with floor, and washer must be level to operate properly. -Check floor for flexing or sagging. If flooring is uneven, a 3/4″ (19 mm) piece of plywood under your washer will reduce sound. -Load dry items in loose heaps evenly around washplate. -Adding wet items to washer or adding more water to basket could unbalanced the washer. -Wash smaller loads to reduce imbalance. -Use Bulky/Sheets cycle for oversized, non-absorbent items such as comforters or poly-filled jackets. -It is normal to hear metal items on clothing such as snaps, buckles, or zippers touch against the stainless steel basket. -Objects may be caught in washer drain system. -It is normal to hear the pump making a continuous humming sound with periodic gurgling or surging as final amounts of water are removed during the spin/drain cycles. 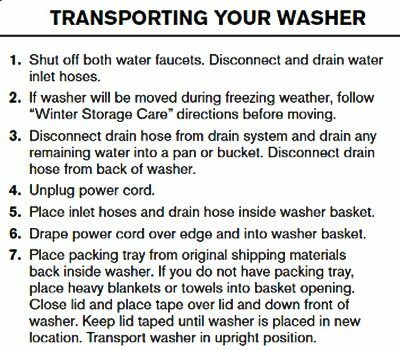 -Washer may be draining water. -You may hear the hum of the sensing spins after you have started the washer, this is normal. -Load sensing may be occurring. -Water may splash off basket if washer is not level. -Check that load is not unbalanced or tightly packed. -Fill hoses not attached tightly. 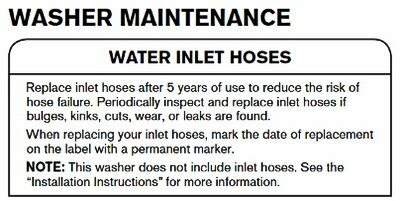 -Make sure all four fill hose flat washers are properly seated. -Pull drain hose from washer cabinet and properly secure it to drainpipe or laundry tub. -Check household plumbing for leaks or clogged sink or drain. -Water can backup out of a clogged sink or drainpipe. 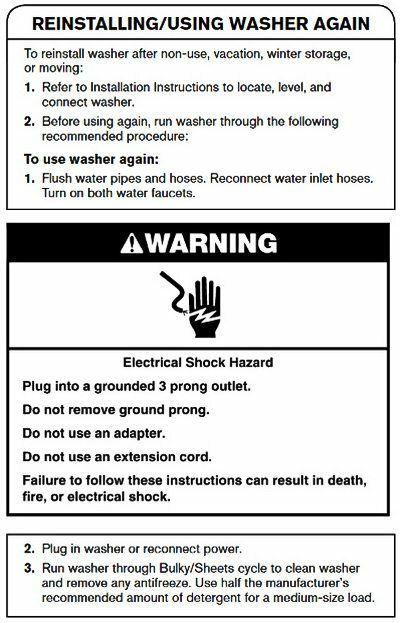 -Do not place tape over drain opening. -Unbalanced loading can cause basket to be out of alignment and cause water to splash off tub. -Washer not loaded as recommended. -Not enough water in washer. -Load not completely covered in water. -This is normal operation for an HE low-water washer. -The load will not be completely underwater. -The washer senses load sizes and adds correct amount of water for optimal cleaning. 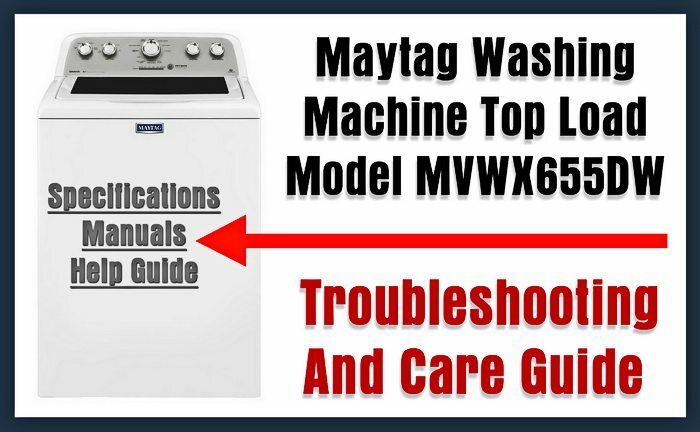 Maytag MVWX655DW Washer Manual is HERE. Next post: Top 10 Tips To Make Your Home Dust Free – No More Dusting!